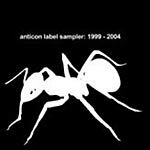 A sampling of Anticon of the past and Anticon of the future, spanning from '99-'04....some songs are edited for length to fit everything onto one disc. If you often find yourself having trouble sometimes deciding which artists from this label to choose from and can't make up your mind, here's 33 songs, for 7 bucks!!!! Compiled, edited & sequenced by Odd Nosdam, with help from Why? & Jel.